Video game crossovers can be some of the most complex things to try and pull off. Why? Each franchise has its own look and feel. Professor Layton vs Phoenix Wright Ace Attorney works diligently to weave gamers through a story that uses both franchises. There are some things in this 3DS game that are expected and some that were very surprising. 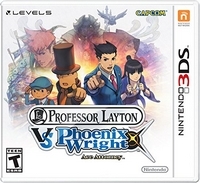 Professor Layton vs Phoenix Wright Ace Attorney deals with a girl being chased by witches. Families need to be aware of the supernatural nature of this hand held video game. There are also some pokes at Christians in Professor Layton vs Phoenix Wright Ace Attorney in regards to witch trials. At first I thought it was fantastic that there are two different gameplay styles in Professor Layton vs Phoenix Wright Ace Attorney. If I got tired of the puzzles of Professor Layton, then I only had to persevere until the game brought me to a Phoenix Wright area. I discovered something about myself while playing Professor Layton vs Phoenix Wright Ace Attorney. I don't like how Phoenix Wright plays. I can tolerate Professor Layton to a point. Professor Layton vs Phoenix Wright Ace Attorney has violence, blood, enticement to lust, and bad attitudes. The Phoenix Wright portions of this Nintendo 3DS/Nintendo 2DS game really bring it down. Professor Layton vs Phoenix Wright Ace Attorney earns its thirteen and older only ESRB rating. If you are trying to decide between a physical copy and a download copy of Professor Layton vs Phoenix Wright Ace Attorney, let me share an important piece of information. Professor Layton vs Phoenix Wright Ace Attorney is over eleven thousand blocks in terms of memory. If you do not have enough room on your SD card you will want to go with a physical copy. Fighting game crossovers have worked for years. I am not sold on Professor Layton vs Phoenix Wright Ace Attorney though. The game play styles are just too different.The Phoenix Wright portions used up my hints, and they were not always useful in exposing the contradictions. In my opinion Professor Layton vs Phoenix Wright Ace Attorney is only for gamers who really love both franchises. If you like just one, then you are going to be annoyed by the other one. If you are not a fan of either, then definitely pass on Professor Layton vs Phoenix Wright Ace Attorney. Finally if all of the content issues bother you, then you also need to pass on Professor Layton vs Phoenix Wright Ace Attorney.